Constructed of Indonesian hardwoods, this fully furnished Studio Ohana sits on the beautifully landscaped grounds of an estate overlooking the beautiful Hamakua Coast. Just 25 minutes from Hilo, the property enjoys sweeping views across fields and trees down to the ocean with spectacular sunrises. A variety of organic fruits, vegetables and exotic plantings fill this 3-½ acre property, and a small flock of sheep resides, picturesquely, in the pasture. A relaxing, aesthetic & truly Hawaiian experience, perfect for anyone seeking privacy & nature. This is a rare opportunity to enjoy the splendor of one of the Big Islands premier – and most sought after – locations. . The estate is completely off-grid but with all amenities available for a luxurious ‘living green’ experience. Fully enclosed open air bathroom attached to the cottage. Hilo, for all your shopping needs, is only 25 minutes away. Property located on the slopes of Mauna Kea Mt. Built of luxury materials, including imported hardwoods, bamboo, granite countertops, and marble floor in kitchen, the Ohana features a large living room with screened-off bedroom; separate kitchen area (refrigerator, cook top, hot & cold water); lanai; ceiling fan; large walk-in closet; and, beautiful and totally private, enclosed and covered outdoor bathroom. The structure is elegant, charming, and unique. Mary was a wonderful host and her guest house was a beautiful! She has many thoughtful touches that made our stay complete and easy. Her property is amazingly gorgeous and very well cared for. She offered us a sample of her incredibly good coffee that she grew on the property. Copper and Puna, her two large dogs were a nice treat for the dog lovers that we are. Very sweet. Copper is an impressive boy and Puna is a super sweetie. The environment is delightfully peaceful since you’re quite far from town or neighbors. There is an incredible array of birds and animal sounds like that invasive frog that chirps through the first part of the night. These sounds are quite loud, but we found them very pleasing and a nice natural ambiance that is not found in city life. Overall, we loved staying here and were delighted to meet Mary and her dogs. We will consider this place on our short list when we visit the big island again. PS- we found the conservation of water and power to be quite easy to work with. The kitchen served our needs to cook 2 meals a day. Mary was a terrific host and the property was as advertised with serenity beyond what that you would expect. We had a wonderful time and would highly recommend it. The most lovely and tranquil place. Totally enjoyed our short stay. Great bed, love the private out door toilet and shower. Plenty of hot water. Awesome hidden location on the north/east coast of the island. Isolated, beautifully constructed. Any 4W drive or standard economy or mid size car can handle the driveway which seems steep but is easily manageable. The building has all the basic amenities plus more. There is no Wi-Fi, but you are on vacation so it shouldn't be a big loss. Copper and Pune (doggies) are sweet and cuddly and super well behaved. The outdoor shower is private, good temperature, great water pressure. Bed and overall furniture is comfortable. Mary gave us perfect directions to find the road and the house, plan to go in the day hours as finding it at night would be very difficult. 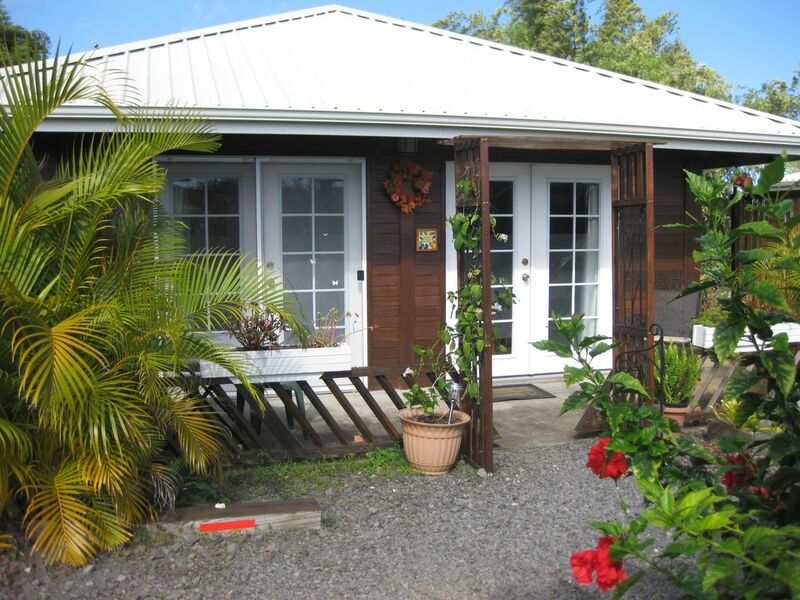 Nearby: Akaka Falls; Tropical Gardens; swimming, surfing & snorkeling. Hilo, 19 miles away, offers golfing, museums, theaters, shopping, a variety of fine cuisines, kayaking, Japanese gardens, beaches, university, the Macadamia nut factory, a rainforest zoo, and a coffee mill. Kilauea volcano is close-by & well worth a tour - especially at night when the red-hot lava flows into the ocean.